A survey conducted in six European countries has found that consumers like the idea of interactive out-of-home advertising — but they expect a ‘value exchange’ in return for interacting with advertising and the most popular incentives are money or entertainment. A survey of 9,000 people in the UK, Ireland, France, Spain, Italy and the Netherlands has found that consumers are interested in interactive out-of-home advertising, but they expect to get value in exchange for taking the trouble to interact with an ad. The survey, conducted by Kantar Media for out-of-home (OOH) media owner CBS Outdoor International, found that 74% of smart device owners have interacted with OOH advertising at least once, but public awareness of interactive technologies is still low and adoption rates even lower. Audiences were asked about their awareness of a range of mobile interactive technologies. 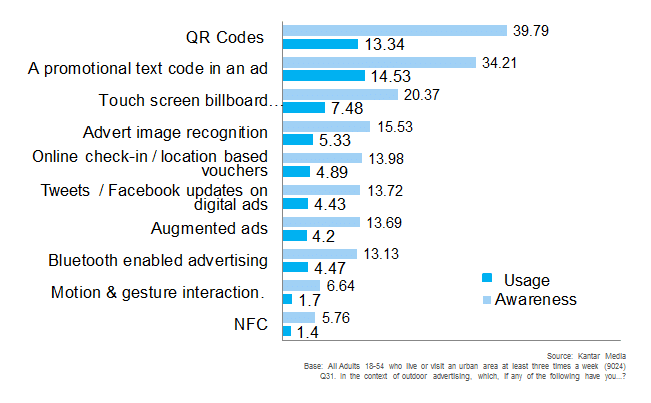 QR codes were the most well-known and well-used. NFC remains the least well recognised, with just 5.76% of respondents saying they are aware of the technology and 1.4% saying they have actually used it. SURVEY: "In the context of outdoor advertising which, if any, have you...? Click to enlarge. Audiences expect a ‘value exchange’ in return for going to the trouble of interacting with out-of-home media, with the main incentives being money or entertainment. Interaction rates are driven by both the creative proposition and the reward for interaction, rather than the specific technology employed. 51% of those surveyed said they were more likely to pay attention to out-of-home advertising than any other form of advertising. This figure rose to 56% among smart device users, 71% of whom said they “feel more positive” about brands that offer OOH interaction. 74% of the audience said that they expected “big brands” to advertise OOH. OOH engagement is highest among younger and smart phone-enabled audiences. 18-34 year olds were most likely to say they found OOH “a welcome distraction” and smart phone owners were more likely to answer positively than non-owners. 66% agreed that “outdoor advertising is a welcome distraction when I am travelling.” This figure rose to 70% for smart device users, 71% for 18-34s and 72% for smart device users aged 18-34. 32% of smart device users said that, after seeing an OOH ad, they had gone online to learn more about a brand and 20% said they had then purchased a product. “This research shows that increased smart device ownership and the eternal need to be connected to the online world are adding strings to the OOH bow and driving deeper levels of engagement,” says CBS Outdoor International CEO Antonio Alonso. “The personalisation of technology — and the interactive behaviours it facilitates — enable people to interact with brands OOH in new ways and more than ever before. The public will reward the brands that get it right by engaging on a deeper level and generating positive word of mouth on and offline, but need to be careful not to deliver a disappointing interactive experience. 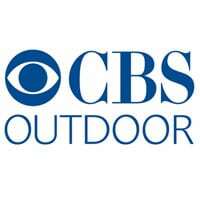 The findings also suggest, CBS says, that although audiences are broadly welcoming of new technologies, advertisers still need to be mindful that many consumers currently find the array of interactive technologies available to them confusing. 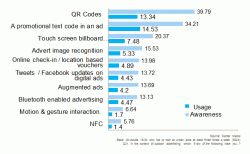 • NFC World is running a free webinar on “NFC Advertising in Practice” on 18 April. Sign up to attend here.